Conversational AI signals a huge advancement in the way we interact with computers. Unlike menus, touchscreens, or mouse clicks, using our voice to have a conversation is one of the most natural ways to use a computer; it requires no learning curve. Conversational AI systems are computers that people can interact with simply by having a conversation, our most natural form of interaction. In short, it is what allows us to talk to voice-driven technologies like Amazon Alexa and ask about the weather, order products online, and even call a cab, simply by using the language we already know. With conversational AI, voice-enabled devices like Amazon Echo are finally starting to enable the sort of magical interactions we’ve dreamed of for decades (think: Star Trek computer). Through a voice user interface (VUI), voice services like Alexa can communicate with people in ways that feel effortless, solve problems, and get smarter over time. Conversations can be conceptually and emotionally complex; they entail much more than simple input and output. When we talk to each other, how we say something also matters as much as what we say. Computers can’t grasp these nuances, and that’s where voice design comes in. A well-designed VUI is flexible, and takes into account these unwritten rules of conversation. It enables computers to think and talk as we do, and not like a robot. Here are four key elements of conversations to remember when designing conversational experiences. Everyday conversations take many things into account besides just the words we speak, including why, when, and where we converse. When designing for voice, think about how you can give Alexa context to provide a delightful conversation. For example, “Alexa, remind me to buy groceries tomorrow,” is a simple request if made during the daytime; make the same request at 1am, and “tomorrow” could mean two different days and should be clarified. Face-to-face conversations are filled with personality, emotion, and even surprises; you never know what someone is going to say next. When appropriate, incorporating these quirks can make interacting with Alexa feel more like having a conversation. Conversations are not isolated occurrences. They build on previous questions and answers, whether from five minutes or five days ago. When appropriate, voice-first experiences should account for prior context to make the conversation more engaging and relevant to the user. There are many other layers to creating natural conversational experiences. For example, you should present only the most relevant information needed in a concise and simple way. Then, gradually build on the user’s response with follow-up questions and information. Remember that we often use many combinations of words and phrases to mean the same thing. Sometimes we ask imprecise questions. In the appropriate context, sometimes we tell jokes. A well designed voice-experience becomes a conversation when it takes all of these things into account and feels like it doesn’t follow a script. There are many elements to voice design, but you don’t need to be an expert to start designing and building voice experiences.  Anyone can create for voice using the Alexa Skills Kit (ASK), a collection of self-service APIs, tools, documentations, and code samples that makes it fast and easy to build for Alexa. With ASK, anyone can leverage Amazon’s pioneering knowledge in the field of voice design and get started quickly. Start creating for voice today and help shape the UX of the future.